- Know someone who's traveling in January, who needs a housesitter? Let me know! I'm available until January 20. 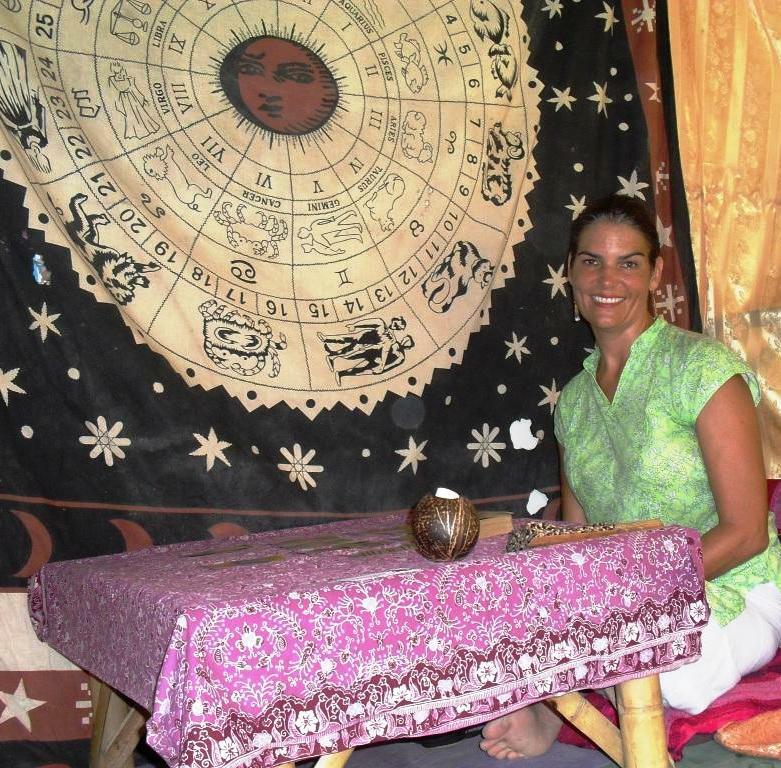 - Holiday gift certificates available for Tarot and Astrology sessions via Skype, phone, or email. Great for that person who needs intuitive insight for the coming year! Contact me via email for more information. - I just received the following editorial review for my new short story, Ramesh's Grace: A Simple Story of Waking Up (available on Amazon Kindle here). "Erin Reese's crisp story is a tantalizing synopsis of one person's passage - both unique and archetypal at the same time - on the classic Vedantic path from ignorance to knowing and darkness to light. One hopes that more details are on the way." In the words of George Harrison, "The farther one travels, the less one knows." See you on the cosmic road! Watch this beautiful YouTube montage of The Beatles' "Inner Light." This captures the essence of my India experience, too. 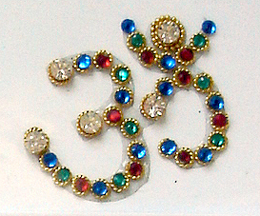 OM SHANTI OM: Special Gift for You! This Wednesday is 12-12-12... a super-powered day of cosmic transformation. We are gearing up for the Winter Solstice on 12-21-12. Many of us are already feeling a deepening or a quickening as we dwell in the darkest time of the year. Seed visions are being prepared underneath the soil. 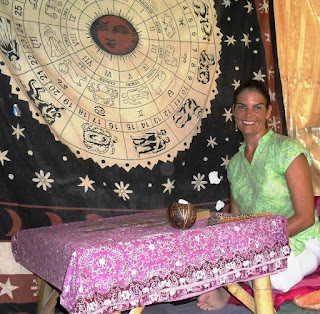 Tarot readings via email by DONATION, just for 12-12-12. WHEN: Send your question to me by end of day, December 12, 2012 PST. Please feel free to repost this link and share with interested friends and family. Here is a YouTube video with one of my favorite shanti mantras. Enjoy. 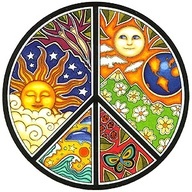 The Shanti Mantras or "Peace Mantras" are Hindu prayers for Peace (Shanti) from the Vedas, found in Upanishads. They are supposed to calm the mind of reciter and environment around him/her. 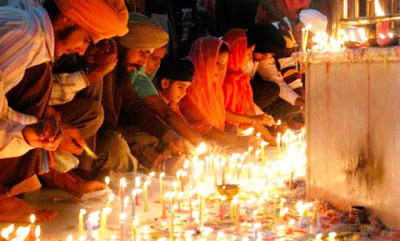 Reciting them is also believed to be removing any obstacles for the task being started. Is there space within this relationship? Eckhart Tolle on the transcendental dimension of true love. 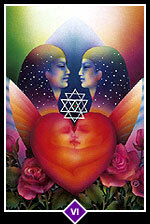 True love is transcendental (transparent). If the formless is not recognized, there can be no transcendental dimension (shining beyond) and there can be no true love. Moving out of personal love. Falling in love with the form [of a person] can only be a personal (subject/object) relationship, which can only change due to the nature of Reality (= impermanence). There IS only change. If the transcendental dimension is not recognized there can be no impersonal love. If you only have egos interacting, a lot of unhappiness is there without the transcendental shining through. No matter how close the bonds are, it can only be a form of suffering. Sometimes the other dimension of transcendence comes through - a glimpse, e.g. perhaps you are about to break up and there, it becomes apparent. SPACE is the keyword. If all you have is thoughts and emotions, occasionally you are okay but then you just get tired; there is a continuum of stuff, stuff – so much stuff, it never ends! Personal affinities between two individuals are there, yes, but these are never ultimately fulfilling and more often a source of suffering. 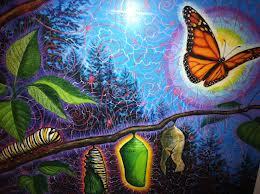 The key is space and from there you move into the transcendence [recognition of the formlessness; transparency]. 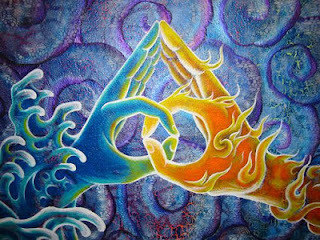 How does the transcendental dimension come into relationships? By being spacious with the other. Access the stillness while you look and experience the other. Any thought or emotion becomes unimportant. A mantra could be: Is there space within this relationship? Awareness. Stillness. Aliveness. A space. Author Erin Reese reads the "Arrival" chapter from her #1-rated travel book, The Adventures of Bindi Girl. November 24, 2012, San Francisco. Special thanks to PL Interactive, Inc. for footage. Erin Reese releases “Ramesh’s Grace: A Simple Story of Waking Up” today on Amazon Kindle. I am releasing my first spiritual ‘single,’ a short story on Amazon Kindle, just in time for the holidays, the Solstice, and the big 2012 To-Do. The single, “Ramesh’s Grace: A Simple Story of Waking Up,” was written in honor of my beloved Teacher Ramesh Balsekar. 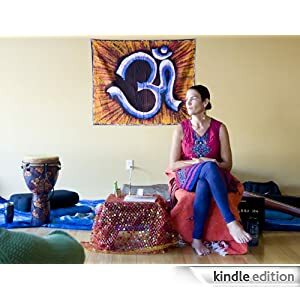 Erin Reese is a spiritual travel writer and the author of the #1-rated book, The Adventures of Bindi Girl: Diving Deep Into the Heart of India. 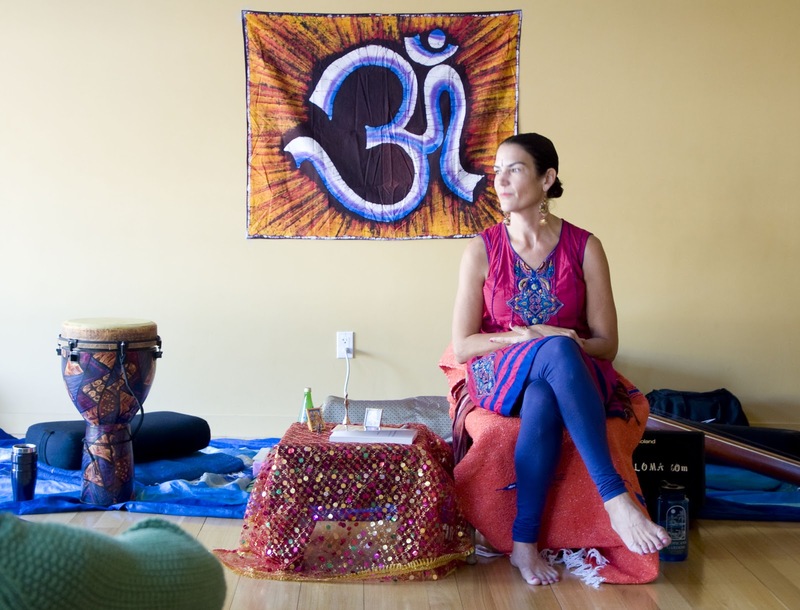 In this short six-page piece, Reese shares a tale of awakening based on the grace of her guru, the late advaita sage Ramesh Balsekar (1917-2009). She sat with Ramesh in Mumbai, India during the last two years of his life, receiving transmission and non-dual teachings on the nature of reality. Awakening is an appearance in time and space. It happens, or rather, it appears only in the Now. Perhaps this is one reason why I could not even name the date in which I realized that there was no separate self. It was sometime in mid-February 2011. I woke up and simultaneously ceased to exist, knowing there was no separate ‘me’ operating, no central Erin as a locus in time and space. This realization made me giggle with glee to the tips of my toes – and still does! You can read more about this in the short story, Ramesh’s Grace, available now on Amazon Kindle. It takes no time at all to wake up. Bindi Girl opens for Convergence: Tonight in SF! Digested your Thanksgiving Dinner? Ready to shake a turkey tail feather? 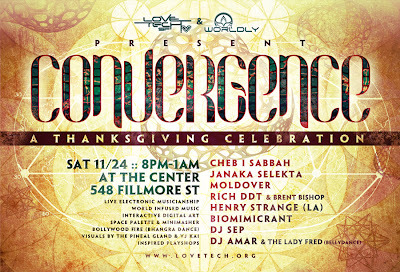 For those of you anywhere near San Francisco, give thanks, come on down and get down at Convergence, a Dance*Music*Art Celebration hosted by LoveTech and Worldly. 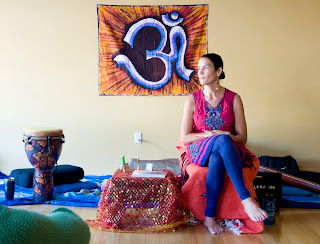 The Center is a unique community/art/healing venue located in an old church rectory in the Lower Haight. Bindi Girl (c'est moi!) opens the night up at 8pm SHARP in the PlaySpace room with a reading from The Adventures of Bindi Girl followed by a Q&A on India quests 'n travels! Be sure to stick around to hear amazing world-tech music from some of my favorite local artists, including Moldover and the legendary Cheb I Sabbah. NOTE: I'll be performing at 8pm sharp! Early birds, come on down! Hope to see you there, or somewhere on Planet Earth, soon! You may practice yoga and meditation to awaken body, mind, and soul, but do you know about the gunas? No, the gunas are not beings from another planet. 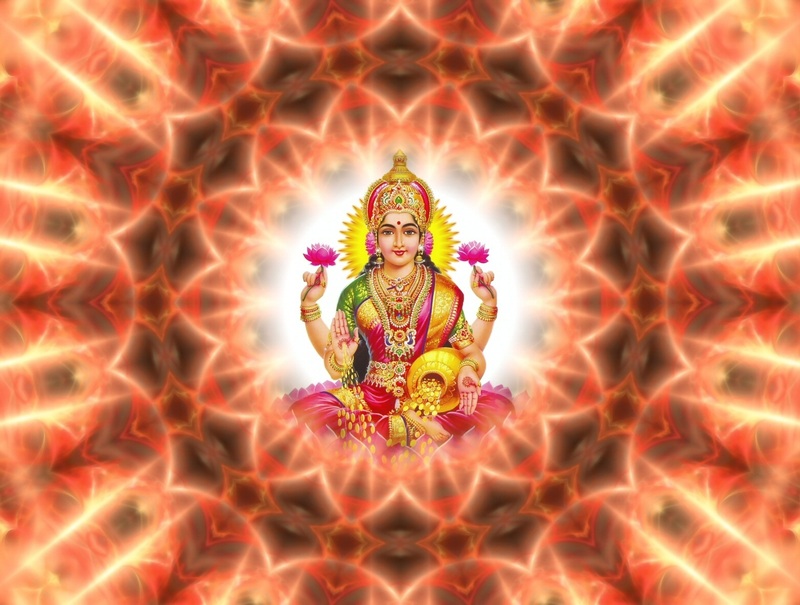 The gunas are the energies of the physical and psychic universe. They are very helpful to understand, for they describe the ever-flowing, ever-changing nature of Reality. On a recent retreat at the Vedanta Society of Northern California, I copied down the following notes on the gunas from the celebrated text, The Spiritual Heritage of India, by Swami Prabhavananda, a beloved philosopher and monk in the Sri Ramakrishna lineage. I found the description illuminating and precise, and so thought to share them with you, too. The word guna literally means quality. Guna can also mean “the rope that bends.” Gunas are bundles of energies or forces which are never at rest. They are the material cause of the psychic and physical universe. One of them at any moment predominates. The three gunas are: sattva, rajas, and tamas. · Sattva informs all that is pure and fine. · Tamas informs the principle of solidity and resistance. All three gunas are present in everything, but one guna always predominates. For example sattva (also written sattwa) is predominant in sunlight, rajas in an erupting volcano, and tamas in a block of granite. 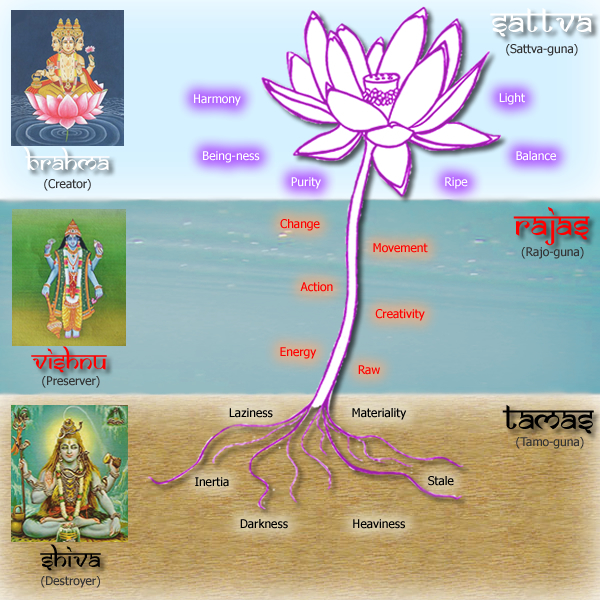 The gunas also represent the different stages in the process of evolution of any particular entity. Sattva is the essence or the form to be realized; tamas is the inherent obstacle to its realization; and rajas is the power by which the obstacle is removed and it becomes manifest. Sattva finally is the power by which a product manifests itself to consciousness. How does this translate to qualities of MIND? 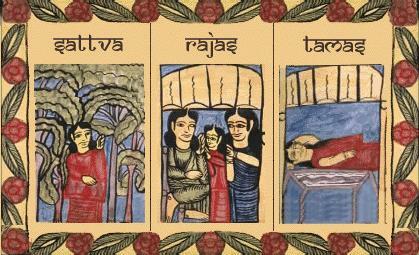 Rajas is the key to overcoming Tamas and moving into Sattva, i.e. 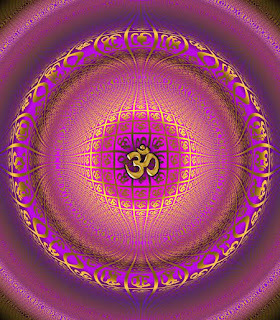 The ultimate is to transcend Sattva also and reach the Purusha, the unchanging principle of intelligence. Purusha is the real Self, which is above and beyond the gunas. Bindi Book Bash Update - let's do it again! 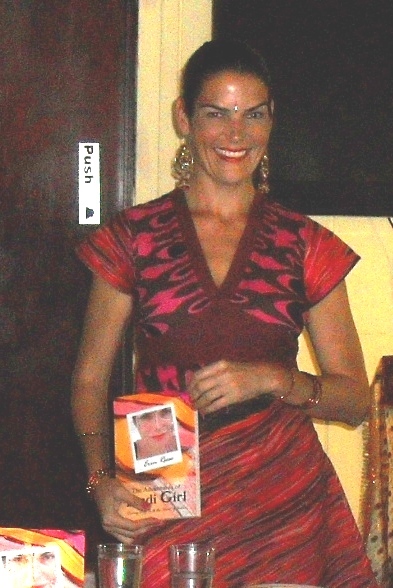 who came to the October Bindi Book Parties! Both the "Chai and Bindi Party" and the "Bindi Book Bash and Kirtan" were fabulous events. I got a real kick out of speaking bad Hindi with the Indian waitstaff at the San Francisco event, with Bollywood on the big screen behind me. It was great to share authentic and delicious chai tea and samosas with some of my closest friends in celebration of my book success. The India Q+A session was also moving. The attendees had powerful questions that made me stop and think. I loved sharing my experiences about surrendering to the art of long-term travel and pilgrimages, and my personal spiritual journey - diving deep into the heart of India. I can't wait for the next chance to speak about these topics in public, and I welcome the opportunity. Bindi is the #1-rated India travel book on Amazon. Have you given Bindi a review on Amazon? If yes, THANK YOU! If 'not yet,' please do so here. Every review helps an indie author to get the word out. Thank you friends, fans and family.